VIVOTEK IP8165HP is a professional box network camera offering up to 60 fps @ 2-Megapixel resolution with superb image quality. Featuring the improved Wide Dynamic Range Technology WDR Pro, it provides superior visibility in high light contrast environments with 2-shutter capture method. Combined with 3D Noise Reduction Technology, users can identify an increased level of image detail in extremely bright as well as dark environments without occupying or wasting unreasonably high bandwidth. To provide top-notch image quality, IP8165HP also comes with a P-iris lens, which controls the iris with extreme precision with its built-in stepper motor. By using software controls, the lens maintains the iris opening at an optimal level at all times, resulting in superior sharpness and depth of field. Furthermore, for installers, properly adjusting the focus of a megapixel network camera can be difficult due to the level of image detail. 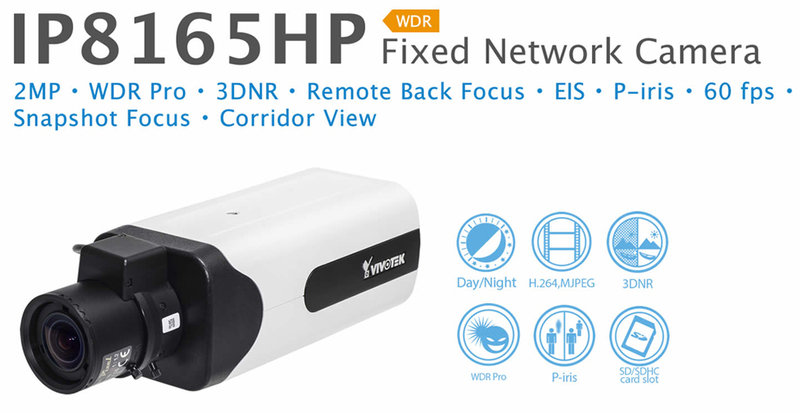 Therefore, IP8165HP is also designed with VIVOTEK’ s RBF (Remote Back Focus) System for installer to adjust focus more precisely.